In the 1820s the emissaries of a dour Wesleyan god reached Tonga, & began to coax chiefs to their side; at the same time, in Wesley's homeland, William Mariner's account of his life as a castaway & captive in pagan Tonga was being read excitedly by radical intellectuals. The teenaged Mariner had lived in Tonga for four years, as the adopted son of the warlord Finau Ulukalala, after Ulukalala's soldiers stormed the British ship Port au Prince in Ha'apai & killed almost all of its crew. Mariner's memoir gave precise and often fond accounts of Tongan feasting, fighting, spirit possession, surgery, & sailing. 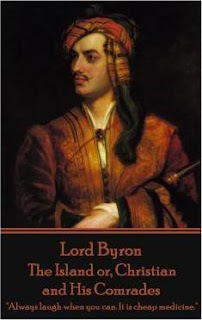 According to his first biographer, Lord Byron was obsessed with Mariner's account of the Friendly Islands, & 'never tired to talking about it to his friends'. Byron's last long poem, The Island, is a paean to the pagan, sensual Tonga that the poet's Wesleyan countrymen were about to dismantle. Byron wrote The Island in exile, without access to most English-language accounts of the Pacific. In his poem, islands are lifted from one archipelago & dropped in another. Byron sets most of the action on Tubuai, aka Toboonai, but shifts that island from the Australs to Tonga, and fills it with Tongan detail. Byron takes his readers to Mu'a, aka Mooa, the ancient capital of Tonga, & to Pulotu, aka Booloto, island of the dead. He shows the tautahi, or sea warriors, of the Ha'apai Islands, leaving their kava bowls to fight Fijian rivals. When the British Empire comes hunting the Bounty fugitive, Byron hides him and his Tonga lover, a Princess Neuha, in the speleological marvel often known nowadays as Mariner's Cave. The cave's entrance is covered with water, but it curves upwards, and ends in an air-filled chamber, which swimmers with strong lungs or a tank of air can reach. Today Mariner's cave is a tourist attraction; in the nineteenth century, though, it killed a series of palangi adventurers, including the captain of the naval vessel HMS Esk in 1869, who cut his back on the watery's tunnel's roof. I'm bringing Byron's poem up to Tonga with me. I hope that my friend Visesio Siasau, who is trying to remember & revive the pre-Wesleyan Tonga in his art, will see the great Romantic poet as a comradely spirit, a collaborator. I've almost never read a poem by Byron except his one re the Assyrian coming down like a wolf on the fold and a few others. For some reason I didn't get to him. Wordsworth, Coleridge, both Shelleys, Blake, some of Goethe, Lamb, de Quincey, Scott, and Hazlitt. But almost no Byron. I see that poem in a book of Byron's works I have. Thanks for unveiling this. I'll have a look at it some time. All the best to you and Sio! Makanya banyak sekali para pemain yang mencari cara warnetqq , pasarqq agar menang bermain ceme online terpercaya dan bisa mendapatkan kemenangan sangat besar.